We’d love your help. Let us know what’s wrong with this preview of De weg van de krijger by Chris Bradford. De Engelse Jack Fletcher (12) wordt in 1611 bij de kust van Japan als enige overlevende van zijn schip gered door Samoerai Masamoto Takeshi. Op diens school wordt hij opgeleid in de 'Weg van de Krijger'. Vanaf ca. 14 jaar. To ask other readers questions about De weg van de krijger, please sign up. Shania Oh yes. It is an amazing book. Does anyone know if the last 3 books are already available in The Netherlands? I REALLY like the first 4 books and i'd love to read them all. Great book, an epic story. I bought this for my 9 year old son who has a tast for reading. As soon as he finished it he immediately asked for the next book. When he sprinted through that one as well I thought I should see what the book is about. Growing up in the 80 with movies like American Ninja (the fact that Jack Fletcher is British simply made the book better for me), the book did have a bit of a nostalgic feel to it. However I did not think that the story have such a high level of authenti Great book, an epic story. I bought this for my 9 year old son who has a tast for reading. As soon as he finished it he immediately asked for the next book. When he sprinted through that one as well I thought I should see what the book is about. Growing up in the 80 with movies like American Ninja (the fact that Jack Fletcher is British simply made the book better for me), the book did have a bit of a nostalgic feel to it. However I did not think that the story have such a high level of authenticity of detail about feudal Japanese culture, and about martial arts themselves. It is an action packed story, which perfectly capture the essence of the Samurai and martial arts. This is definitely a credit to Chris Bradford's training/research. Khurram My son read it when he was younger then 9. The book Is not gory but there are killings in the book. I would call this my for young teens. I wish I were the first to notice, but alas, it's obvious and has been noted by others -- author Chris Bradford was channeling Harold Potter when he wrote this book. Replace orphan Harry with orphan Jack Fletcher, moving from Muggle Land to Wizardry with moving from England to feudal Japan (thanks to a shipwreck). In place of Dumbledore, insert Masamoto, Master Samurai, and swap Hogwarts for Niten Ichi Ryu, a venerable school populated not with good and evil professors but with good and evil sen I wish I were the first to notice, but alas, it's obvious and has been noted by others -- author Chris Bradford was channeling Harold Potter when he wrote this book. Replace orphan Harry with orphan Jack Fletcher, moving from Muggle Land to Wizardry with moving from England to feudal Japan (thanks to a shipwreck). In place of Dumbledore, insert Masamoto, Master Samurai, and swap Hogwarts for Niten Ichi Ryu, a venerable school populated not with good and evil professors but with good and evil sensei. More? How about a funny friend (Saburo, not Ron) and a pretty friend who's a girl (Akiko, not Hermione); a bully (here Kazuki, there Draco); and a killer enemy out for our young hero (not He-That-Shall-Not-Be-Named, but Dragon Eye, a.k.a. Dokugan Ryu). Not original, I admit, but still satisfying. Why? Two reasons. Chiefly for the young (though adult readers will enjoy the ride) is the plot. Yes, it's predictable and sometimes pushes the suspension bridge of disbelief, but it's what the people want! And then, for adults (though young readers will be willing to "eat their mental vegetables," given the cheese sauce plot), a wonderful embedding of Japanese culture, history, and vocabulary. Bradford knows his stuff, in other words, and he makes a point of making HIS appreciation of the Japanese OUR appreciation thanks to this book. Finally, good or bad, this is the first of (gasp! can you be-LIEVE?) a series. Yes, we can blame HARRY POTTER for a lot of this, but it's what the kids like and what the publishers like even more (how do you say "money" in Japanese?). When I first heard about this book, I was like, “WOW talk about a fantasy I’ve had. I so have to read this book!” It sure wasn’t a disappointment either. It’s not very often I find a book that I just can’t put down. Right from the start I was invested in the main character, Jack Fletcher. The whole story and how Jack behaved I could so relate to. So many times in YA novels you read something and go “yeah right! No 12 year old would react like that.” I never felt like that while reading this book. Highly recommended to anyone that’s into martial arts. English boy shipwrecks in Japan get taken in by a Samurai family and learns Kubodo, this should have been right up my street! The only problem is that it's been done before and so much better! For anyone who has not read James Clavell's Shōgun you will enjoy this as an easy interesting read, but for those of you who have, this will be a poor lackluster copy that boarders on plagiarism! 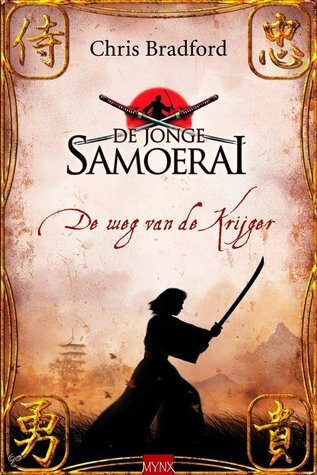 (view spoiler)[The first part of this book covers the journey of a Dutch ship piloted by an English man who uses English boy shipwrecks in Japan get taken in by a Samurai family and learns Kubodo, this should have been right up my street! The only problem is that it's been done before and so much better! I have just summed up the beginning of both books! Only one of the books was written when Chris Bradford was still wearing nappies/diapers! The "similarities" go on! There is even a crew member called Ginsel which was not even a very popular Dutch name! Throughout the book Chris Bradford gives credit to the people who's quotes he uses, but at no point does he make any references to James Clavell! Not once! Had even mentioned that Shōgun changed his life or that this was an homage there would be no problem! Okay, next part of the book! Again, this may also sound a little familiar! There is even one random passage where the young boy takes the girl outside and shows her some of the constellations, with all the possible constellations to chose from Chris Bradford chooses Bellatrix and Regulus! Come on! Chris Bradford writes really well! It's just a shame that most of the ideas aren't his! Taking inspiration from others is one thing but in that case you at least give them some credit! Seorang bocah Inggris, Jack Fletcher, berusia 12 tahun, anak dari nahkoda kapal "Alexandria" John Fletcher. Yang karena keadaan harus bertahan hidup di negeri asing bernama Jepang. Jack, beruntung diselamatkan oleh Keluarga Samurai di daerah Toba, Masamoto. Dalam lingkungan Masamoto lha, Jack belajar banyak. Belajar menjadi seorang samurai dan belajar memahami kehidupan. Cerita dalam buku ini gampang sekali ditebak bagaimana akhirnya. Tapi itu tak menyurutkan saya untuk melanjutkan membacanya. Pe Seorang bocah Inggris, Jack Fletcher, berusia 12 tahun, anak dari nahkoda kapal "Alexandria" John Fletcher. Yang karena keadaan harus bertahan hidup di negeri asing bernama Jepang. Prinsip 1; Gi, Integritas adalah kemampuan untuk membuat keputusan yang benar dan keyakinan moral dan untuk bersikap adil dan sama kepada semua orang tanpa memedulikan ras, warna kulit, gender dan usia. Prinsip 2; Yu, Keberanian adalah kemampuan untuk mengatasi setiap keadaab dengan keberanian dan keyakinan. Prinsip 3; Jin, Welas Asih adalah gabungan antara kasih sayang dan kemurahan hati. Prinsip 4; Rei, Hormat. Prinsip ini berarti menghormati orang lain. Prinsip 5; Makoto, Kejujuran artinya bertingkah-laku yang benar secara moral dan selalu melakukan hal-hal dengan kemampuan terbaik. Prinsip 6; Meiyo, Martabat. Dicapai dengan sikap positif dalam berpikir serta mengikuti perilaku yang tepat. Prinsip 7; Chungi, Kesetiaan adalah dasar dari semua prinsip; tanpa dedikasi dan kesetiaan pada tugas yang sedang dikerjakan dan kepada sesama, seseorang tak dapat berharap mencapai hasil yang diinginkan. "Teman tidak dipisahkan oleh perbedaan. Mereka justru bersatu karena perbedaan"
The beginning did not grab me immediately and I was prioritising other books over this one but I do admit that I was hooked after few chapters . Since I'm a fan of Japan , this book was really entertaining since it revolves around Japan's traditions and cultures ! 'Courage is not the absence of fear, but rather the judgment that something else is more important than fear." So amazing, it had all the tropes in a book that I love. So I loved it a lot. Based on the feudal era Japan, this story takes off when a ship from England, searching for this mysterious land, catch up with a really nasty storm and ends up being dragged to a smaller piece of land. While trying to repair the ship, they are attacked by Japanese pirates and all of them are killed except a twelve-year boy named Jack who somehow survives. Who is dragged to the land by a savior, he is a really looked up to Samurai of the village that's near this port. His own son was killed by a ninja exactly two years ago, so he considers it a sign and takes Jack into his adoption. Things happen and Jack is taken to the Samurai school in Kyoto, where he has to learn all the arts of being a Samurai while dealing with quite a lot of racism. I just love myself a book with Japan. I have grown up watching solely animes, so it was like a throwback to my early middle-grade life. I also will always love a book with Academy aspect. Especially I enjoy reading about training though it is always in the danger of being dragged. Luckily, Bradford was really good at keeping it minimal and interesting. The pacing of this book was really strong. Thematisch gut, aber vielleicht erschreckend für manchen Leser, ist der Umgang mit Jack als "Gajin". Als "Nichtjapaner" gehört er nie dazu und es ist ein regelrechtes Schimpfwort. Dies gilt leider auch heute (oft) noch in der japanischen Kultur insbesondere auch bei Kindern von Japanern und Nichtjapanern, die abschätzig als "Hafu" bezeichnet werden. Ich finde es gut, dass es in dem Buch vorkommt, auch wenn die meisten die wahre Bedeutung vielleicht nicht so ganz wahrnehmen werden. To tell the truth, I was a bit hesitant to begin with the Young Samurai series in the beginning as I didn't have enough data about the series but mocking me it has secured a righteous and a deserving place in my ''memorable'' shelf. It's the first book in the Young Samurai series written by Chris Bradford, who himself is an expert in martial arts and the ''Japanese'' arts and language. The story revolves around a 12 year old Jack Fletcher, a young lively boy who works at a ship piloted by his father in order to discover the unknown lands in the big wide world. But things turn bad as his ship is raided by Dokugo Ryu, a rogue Japanese ninja and assassin and Jack gets stuck in the very orderly land of Japan and is trained as a samurai and makes new friends in order to gain redemption for his fathers murder. The introduction of the characters is done really well. The prologue was crafted remarkably, it gives you of the brief idea about the outline of the novel. Jack Fletcher is a unique and a very different hero, but a true an an original one. The thing that makes this novel stand out from many others is that it is set in the land of the rising sun, that is, in Japan. After, a few introductory chapters and murder of his father, Jack is transported to the shores of Japan and taken to a dojo, this marks the beginning of Jack learning to be civilized and groomed in Japanese culture. The book gives a lot of historical data as well as information and enlightens the reader about Japanese language, tradition and culture. Mark my words, a lot of importance is given to these things which makes it very interesting as you get to learn some real helpful things from a story book. There's a lot of Japanese words too, like Dojo, Katana, Ninja, Bushiden, Zen and a glossary of fifty more frequently being used. The pace of the story is steady, barring the huge time leaps Chris teleports us readers into. Mainly, the story is good, I'm not saying its 100% original but it's written in a very good way. I found that it exactly resembles the Harry Potter universe, just in a different culture, and without magic, but the fundamentals are just the same. Like Jack being Harry, Yamato being Ron (At the end), Akiko being Hermione, Kazuki being Draco, additionally, the book even has a samurai (there wizard) training university like Hogwarts (here Nin Ryu something.) Therefore, I say the book is not entirely original but don't get me wrong it does not fail, in the least way to entertain you. In the beginning you may feel, these Japanese names are harder than chemical reactions but trust you instincts and read on, you will get the idea of who's who as you continue to read a few more chapters and enjoy the blissful experience of getting enchanted by this beautiful Japanese world. The writer describes many places, natural environments in a very fine detail. It may bore some reader as the writer goes into unnecessary details. The characters, mainly Jack, Akiko, Yamato, Masamoto play the main role in the story along with some selective university students and their sensei (Japanese word for teacher). The story progresses and gets a lot better as our young samurais enter the academy and enter various classes martial arts, sword fighting, wrestling, philosophy, meditation, etc. The dialogues are used economically, but impressively. The book contains heavy weaponry and arsenal including swords, shurikens, star blades and frequent bloodshed at regular intervals. The battle scenes cover almost 30% of the book, mostly including training and friendly battles (not really...) and just grab your attention and make you want to read more. But it's not only about war, its also about human heart, love, a lot of philosophy and the true way of living life. The Zen Sensei throws around some very appreciable quotes which are very inspiring which makes it a good reason to gift this book to younger readers. It emphasizes on some moral values like courage, determination, bravery, selflessness, sacrifice. It is indeed a well balanced book. (Just add some creepy supernatural stuff and it would be just perfect.) The villains are classy and I'm sure some particular characters that will play an important role in the future installments. There's some bullying and beating up involved but it ends in a positive way and is forgotten soon. The characters' personality development is done well in just a period of one book. That reminds me, time flows very quickly and jumps months at a time. This book covers almost 10 months of Jack's life as he reaches from England to Japan and starts training at the latter. A perfect book with good vocabulary, stylish Japanese words, culture, brief history, original characters, immersive plotlines, awesome and really malevolent villains, love, friendship, bonds, sword fights, battles and want for power and honour. A well balanced book that took to to a different place and a different time. I look forward on pressing on the Young Samurai series and I definitely will. Nice Reading! This story was a bit like karate kid (the training and final climax where trainers compete by using their trainees in a contest) and also had pirate ninjas and was also historical. All these elements worked well together. I loved that the author so clearly knows what he's talking about when it comes to Japan's culture and language and when it comes to martial arts (I've taken just enough karate to recognize that CB knows what he's talking about). I might disagree with CB's portrayal of Protestantism vs Catholicism, but I'm no historian (I only know what Protestants and Catholics are like today, not 4 hundred years ago). I definitely wouldn't disagree with his portrayal of 17th Century Japan. I like that Jack and his "brother" didn't get along but had to learn to get along. It was reminding people that just because you don't agree with someone now doesn't mean you'll always disagree with them. I liked the discrimination Jack faced and wondered that it was rather mild. He's the only blond kid in thousands of miles. What's that like? I liked that Jack's past of climbing rigging helped him with Samurai training (although it had been a few months since he did any climbing and probably shouldn't still have the muscles to do so . . . but that's okay). I liked that Jack and his "sister" got along so well and had such a great friendship. They help each other train and share their hopes and such. I'm a little lost at why Jack's father's map is so so so valuable to everyone (the priest, the ninja guy) that they're willing to kill for it. Could Jack just make a bunch of copies and start selling them so everyone has an accurate map? I really don't know what it would be like to not have satellite maps of anywhere I want to go. It's so handy and normal that I don't appreciate the convenience. Stopped reading this series at book 4 because it felt like the focus had shifted gradually from fun cool samurai learning and adventures (which is what I was after) to oppressive xenophobia and persecution. This book was okay. Not really my thing, I think. Objectively, the plot was interesting, but I personally wasn't that interested in it. I found the characters flat and typical most of the time, bordering on annoying, there were lots of actions scenes just written as a list of, well, actions which took any and all excitement out of them. I suppose if you're a kid (the target audience for the book) it's exciting to read about what samurai are doing in training, with every single minuscule movement This book was okay. Not really my thing, I think. Objectively, the plot was interesting, but I personally wasn't that interested in it. I found the characters flat and typical most of the time, bordering on annoying, there were lots of actions scenes just written as a list of, well, actions which took any and all excitement out of them. I suppose if you're a kid (the target audience for the book) it's exciting to read about what samurai are doing in training, with every single minuscule movement described even if it detracts from the flow and rush of the scene. Everything was pretty predictable. The fact that there are several sequels to the book tells me that the whole issue of the villain isn't going to be resolved for ages yet. Which makes sense when you consider how much training Jack is going to have to go through to be able to defeat him, but I really have zero interest in finishing the series, or even reading another book in it. The rivalry between Yamato and Jack. Predictable as all heck, but enjoyable because Yamato's situation was very sympathetic, so I was rooting for he and Jack to reconcile their differences. Second thing was Jack learning to meditate. He struggles to clear his mind of thoughts, which makes moving onto the next stages really difficult and frustrating. And I've had that experience. I underwent hypnotherapy sessions in my private therapy, and I utilise meditation frequently in my personal life to help me deal with my anxiety, among other things. I've had these same struggles. It was really surprising to see something so relatable and realistic in this book that, overall, I found very meh. Loved the less than casual racism all the Japanese characters felt towards Jack, the English main character. We Scots feel the same about the English. That was a joke, FYI. Clavell's Shogun meets Rowling's Harry Potter. Both of which I love. The author appears to have done a lot of research about the martial arts aspect of the book, which is interesting. I have lived as a foreigner in an Asian context for a long time now. I love Japanese history and culture. So I should have enjoyed this book. But the characters have no depth and not much consistency. They do what they do ... because that is what they do. Yamamoto hates Jack, until he doesn't. Jack is terrified of Clavell's Shogun meets Rowling's Harry Potter. Both of which I love. The author appears to have done a lot of research about the martial arts aspect of the book, which is interesting. I have lived as a foreigner in an Asian context for a long time now. I love Japanese history and culture. So I should have enjoyed this book. But the characters have no depth and not much consistency. They do what they do ... because that is what they do. Yamamoto hates Jack, until he doesn't. Jack is terrified of heights ... until he isn't. Feudal Japanese are racists, but Englishmen of the same time, especially young boys whose fathers are killed by Asians, are NOT racist ... because ... Jack. Bradford uses a LOT of Rowling's tropes, but without her thoughtfulness. Rowling set up a long backstory for why Voldemort couldn't kill Harry Potter. Bradford gives us nothing on why the most deadly ninja in Japan can't seem to kill a small, half-educated 13 year old. Rowling uses magic. It works because it's magic. But martial arts is based on size, strength, and skill. Yet Jack, the Boy Who Lived, manages to win again and again while greatly disadvantaged in all 3 areas. Bradford makes "culture" a part of the scenery, like the island of Japan and the Japanese words. But there is no depth there. Jack never has a cultural insight. Like "hey, the way Japanese treat their kids is way different from the way my father treated me". Why does Jack's father treat him like a modern father? Because he does. This is what was the best part of Clavell's novels. My summer class is over, so what should I do with my time until fall classes? Hmmm. Obviously a trip to the library was in order. Since middle school I've had an interest in Japanese culture, due to the extreme consumption of anime and manga. So while I didn't think that this book — written for a younger, less nerdy audience — would have too many cultural references, I was mildly surprised. While keeping a more casual tone, there were indeed a lot of things to learn in this book, and a lot of Jap My summer class is over, so what should I do with my time until fall classes? Hmmm. Obviously a trip to the library was in order. Since middle school I've had an interest in Japanese culture, due to the extreme consumption of anime and manga. So while I didn't think that this book — written for a younger, less nerdy audience — would have too many cultural references, I was mildly surprised. While keeping a more casual tone, there were indeed a lot of things to learn in this book, and a lot of Japanese vocabulary used. The characterization of Jack Fletcher, the main character, was mostly believable to me. He wasn't too gung-ho about the fact that he was expected to live in Japan and learn their customs and how to be a samurai, and he was understandably eager to leave. The characterization of the other students made sense too, at first Jack is heckled by calls of "gaijin Jack" everywhere he goes, but like most stories with bullying, that really only worked for so long before Jack proved himself. Surprisingly, I actually really liked the character of Yamato too. I think he showed the most emotion of the cast, and I empathized with him. His brother was killed to send a message to their father, and now it's his job to measure up to his brother's memory. In the meanwhile, his father's expectations seem too high to ever attain and his dad favors a barbarian over him? Yeah, that's a lot of pressure for one person. I have a thing for ninjas okay. So this was cool. Also Japanese samurai and swords and a guy who was some sort of version of Yoda and yes. I enjoyed this. You could say that it was a slight copy off some other stories - Star Wars, Harry Potter, Karate Kid - but to be honest I liked it anyway and didn't really mind any of those elements. The main character was quite interesting, but my favourites were probably two of the side characters. Their character arcs were better and heaps more interesting I have a thing for ninjas okay. So this was cool. Also Japanese samurai and swords and a guy who was some sort of version of Yoda and yes. I enjoyed this. The main character was quite interesting, but my favourites were probably two of the side characters. Their character arcs were better and heaps more interesting and engaging. (view spoiler)[ Yes, Yamato was my favourite. I don't know, but he betrayed them and had a pretty hard life and I felt for him and I LOVED how he ended up. And Saburo was random and quirky, and seemed like the kind of kiddo who would be loyal to the very last. (hide spoiler)] Something that I really liked was the fact that all of the characters have these Japanese names like Yamato and Masamoto and then there's the main character: Jack. It was a really interesting and obvious comparison and I liked it. There was some elements that could be not-so-good in some views. [spoiler-ish] (view spoiler)[ One character gets drunk. There's violence and bullying. (hide spoiler)]But none of these elements are portrayed as good or right, so it was fine. The pacing was pretty good the whole way, and then general plot (ignoring the slight rip-offs) was interesting. I loved all the elements of the Japanese culture and those parts were super cool and how it used the Japanese words for some things and just yes. A good book and an interesting look into feudal Japanese culture. I liked the characters and the action. The setting was interesting although I imagine that this is one that is going to develop in later books as Jack's skills develop. This was obviously written for younger readers and the writing style seems like it will keep them gripped and entertained. I wasn't fond of some of the Japanese terminology, I like how this might increase their interest and knowledge of Japanese culture and persona A good book and an interesting look into feudal Japanese culture. I liked the characters and the action. The setting was interesting although I imagine that this is one that is going to develop in later books as Jack's skills develop. This was obviously written for younger readers and the writing style seems like it will keep them gripped and entertained. I wasn't fond of some of the Japanese terminology, I like how this might increase their interest and knowledge of Japanese culture and personally I enjoyed it however some inserts seemed a little overdone. There is a particular scene where Jack is being given directions and there is so much Japanese mixed in with the English I can see this easily losing some younger readers. I might be underestimating them a little bit especially as this book seems to be a much loved and lasting series and as I said personally I did enjoy reading the different terminology. Disney is putting a lot of money into this book. My guess is they're seeing the potential to assume the power vacuum left vacant by the demise of Potter. And why not compare this book to Potter? it's got an orphaned protagonist (Jack Fletcher) in a foreign land, exotic locales, and a school setting full of beauty and danger, history and magic. it's also got an evil antagonist that killed Jack's father. Another reason for the Potter comparison: Young Samurai is freakin' awesome! Poisoned shirukens Disney is putting a lot of money into this book. My guess is they're seeing the potential to assume the power vacuum left vacant by the demise of Potter. Another reason for the Potter comparison: Young Samurai is freakin' awesome! Poisoned shirukens by page 3! You can see the gleam on these ninja swords. you can hear them unsheathing quiet steel death! In the year 1611, a young boy named Jack is on board a ship with his father, searching for new land. But ninjas clamber aboard the ship in search of valuable objects and kill his crew and father. Jack is saved by the legendary samurai warrior Masamoto who adopts him. There he is taken to samurai school where he will have to learn to defend himself against Masamoto's jealous son, Yamato. But with his friend Akiko and quiet companion Yori, Jack is able to fit in at the samurai school and master ba In the year 1611, a young boy named Jack is on board a ship with his father, searching for new land. But ninjas clamber aboard the ship in search of valuable objects and kill his crew and father. Jack is saved by the legendary samurai warrior Masamoto who adopts him. There he is taken to samurai school where he will have to learn to defend himself against Masamoto's jealous son, Yamato. But with his friend Akiko and quiet companion Yori, Jack is able to fit in at the samurai school and master basic moves. But is that enough to defeat Yamato? Jack Fletcher is shipwrecked on the coast of Japan, his father and the crew of the ship have all been slaughtered by ninjas, except for him. Luckily Jack is saved by a legendary sword master: Masamota Takeshi. Masamota adopts him and begins training him through the punishing physical and mental ways needed to be the samurai, hoping one day he can be the first gajin samurai. And so that maybe one day he can seek revenge on Dokugan Ryu, the one-eyed ninja that murdered his father. I thought the plot was great and really hooks you to the next books. Every book in this series is amazing! Chris is renowned for his inspiring author events and ‘method writing’ style. For his award-winning Young Samurai series, he trained in samurai swordmanship, karate, ninjutsu and earned his black belt in Zen Kyu Shin Taijutsu. For his BODYGUARD series, Chris embarked on an intensive close protection course to Chris Bradford is the bestselling author of the Young Samurai, Ninja and Bodyguard Series. His books have been published in more than 20 languages and been nominated for 30+ book awards, winning among others the Northern Ireland Book Award 2011, the Hampshire Book Award 2014 and the Brilliant Book Award 2014. Young Samurai: The Way of the Warrior was deemed one of Puffin’s 70 Best Ever Books, alongside Treasure Island and Robin Hood.